9 Ways To Have Fun With Your Pet This Labor Day! With Labor Day coming up, and many people will find themselves at off work and at home with the comfort of their pets! And let’s face it; most of us aren’t made of money and it’s not always cost convenient when it comes to our lovable pooches. That certainly doesn’t mean it’s impossible to spend some meaningful time together. In fact, it takes very little work to have a ton of fun with them. Here are nine fun things you can do with your dog that suits almost everyone’s budget! Burn some energy. Do some quick research online and find some easy trails within or just outside of your city and take your pup on an adventure. Both of you can get some great exercise in the quiet wilderness. Be sure to bring some water and choose a trail that’s ideal for your dog’s size and energy. Local to Long Island? Check out Avalon Park and Reserve in Stony Brook, Southaven County Park, Camp Hero State Park, and more! Click here for a full list of dog friendly hiking adventures on Long Island! If you can’t get out of the city try, going to your local dog park. It gives you a chance to meet some new people and gives your dog a chance meet some new doggie friends. Are you in Suffolk County? Some of our local dog parks can be found at Bideawee in Westhampton, Blydenburg Dog Park in Hauppauge, and Duke Dog Park in Riverhead. 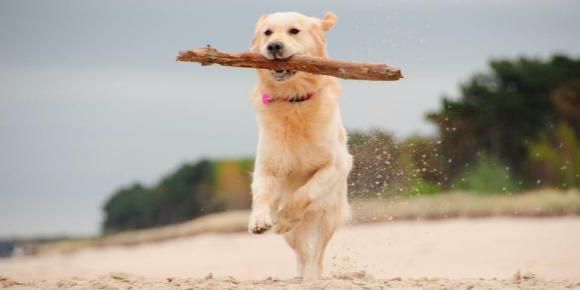 Click here for a full list of Suffolk County Dog Parks! It’s become very easy to find local dog groups that host meet-ups at various venues. The groups are usually breed-oriented. However, you should be able to find a good one suitable for you and your dog. Visit www.meetup.com to check out breed specific groups in your area! Although not all beaches are dog friendly, with a little bit of googling you can catch your rays, take a dip as well as hang out with your dog while taking it easy in the sand and watching the waves. Some Long Island dog friendly beaches include Fire Island National Seashore, Camp Hero State Park, Southampton Parks & Beaches, and more! Click here for a full list of dog friendly beaches on Long Island! Learn to make a new dog toy or bake homemade dog biscuits. You won’t find a better taste tester than your own bottomless stomach pit of a dog. Even if you aren’t a seasoned baker, chances are they will be perfectly happy eating your delicious mistakes. Teach them clicker training. Set up an obstacle course in your yard. Play hide and seek with food. Free time is the best time to teach your dog a new fun trick, exercise their brain or make them a homemade agility circuit. Goof off together. Dress up in silly clothes and take a bunch of embarrassing photos. Post it on Instagram, heck, post it on our Facebook page to share it with us and your friends! Is there anything sillier than a human and their dog dressed up in matching clothes? Curl up, put on a good movie and take a nap together. Rain or shine, nothing is more comforting and bonding then spending some quiet, quality time together while being lazy on the couch. What are some of the fun and inexpensive ideas you’ve come up with for you and your dog(s)? Original Article Credit 3MillionDogs.com. Appropriate edits by the office of Peconic Bay Animal Hospital.